I realized the other day that I haven't done one of these posts in quite some time. I would love some feedback on whether or not I should start back with them again. Or if you have any other blog post suggestions that you would like to see, I would love to hear them! I can't even begin to tell you how happy I am that it's Friday. This has been one long week! I will be doing a little shopping this weekend for gifts and our company Christmas party is on Saturday, so lot's to look forward. Today I'm sharing a few links to take you into the weekend. 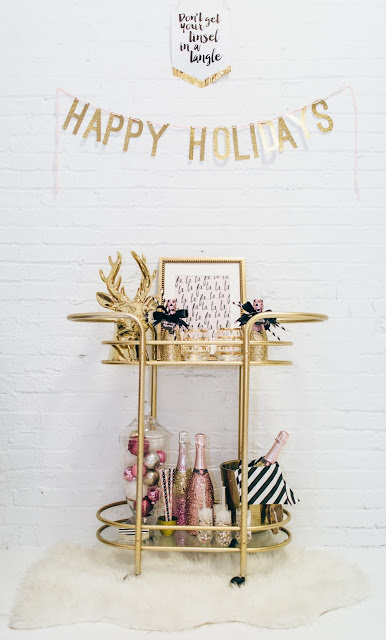 I love this Fa La La La free printable in this photo. Christmas sangria and cranberry moscow mules — the perfect holiday cocktails! Speaking of the holidays, did you catch the gift guide for the entertainer that I shared this week? These new gold hoops I purchased have been on repeat lately. I'm a tropical vacation type of person, but this post really has me contemplating Iceland. 8 Trick for Looking Like a Model in Photos...tell me more! Anybody remember this Christmas movie? It was one of the many my brother and I use to watch as kids.